Although the CNC wood router can not complete a full carving work independently, but compared to the previous hand-carved, has saved a lot of manpower. Hand-carved furniture can achieve customization, not mass production. Hand-carved furniture really more artistic value, however, is now limited to the hand-carved carving scarce in some valuable timber on quality, taking a small minority of consumers customized route, is to meet the spending power and the use of high-end crowd collection needs. However, when people slowly realize that foreign furniture, although beautiful, is really not as good as Falcon after Mao structure made of durable mahogany furniture, traditional furniture, consumer groups will continue to expand, then, a small minority in terms of price and customization capacity is certainly can not meet growing consumer demand. So, if you want more furniture into the consumer's home, and only take the road of mechanized production, production costs diluted, faiths. Use CNC wood router is a kind of practice times. In the furniture industry, before the tools are sawing wood with hand saws for leveling plane, punching chisels, hammers and other tools, and now manufacturers in order to improve the efficiency of the workers, it has been implemented in CNC wood router. Although the CNC wood router can not complete a full carving work independently, but compared to the previous hand-carved, has saved a lot of manpower. And now mechanical engraving applications and manual finishing work closely together to make the carving effect has been greatly improved. Consumers also pay attention to the simple hand-carved turn on the overall effect furniture. 1. The bed is made of strong steel tube structure and it is analyzed and designed with Heavy Duty and Strong Structure which relieves stress and makes working table more steady. 2. Adopt well-known 9.0KW Italy HSD spindle,which is famous brand and has many after service department all over the world.It is air cooling spindle,no need water pump ,very convenient to use.Some low temperature countries also can be used. 3. With high-performance Japan YASKAWA servo motor, the machine can work in high precision.The servo motor runs smoothly,no vibration phenomenon even in the low speed.And it has a strong ability of overload. 4. The automatic tool changer system which contains 6 or 8 pieces of cutting tools is controlled by CNC Syntec Control system.The tools can be changed very quickly and reliably. 6. Break point memory, continuing carving after power outage, forecasting processing time and other functions. 7. Compatible with Type3/ Artcam/ Castmate, and other CAD/CAM design software. 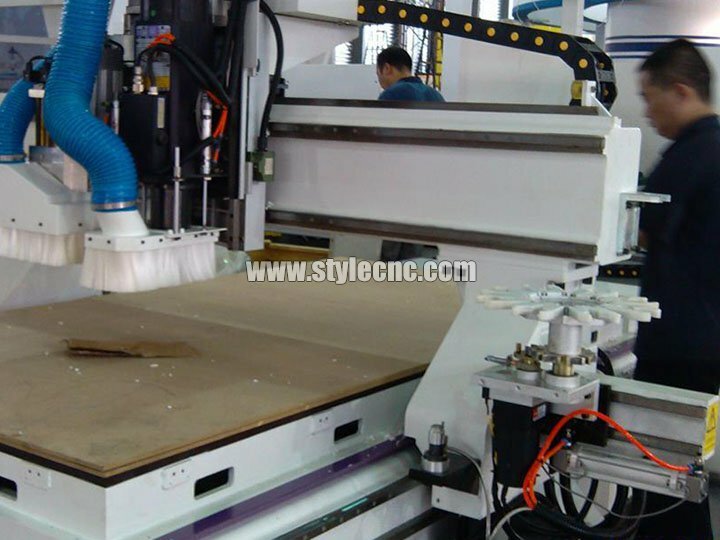 License: The text of "CNC wood router will facilitate large-scale production of furniture" by STYLECNC is licensed under a Creative Commons Attribution 4.0 International License. 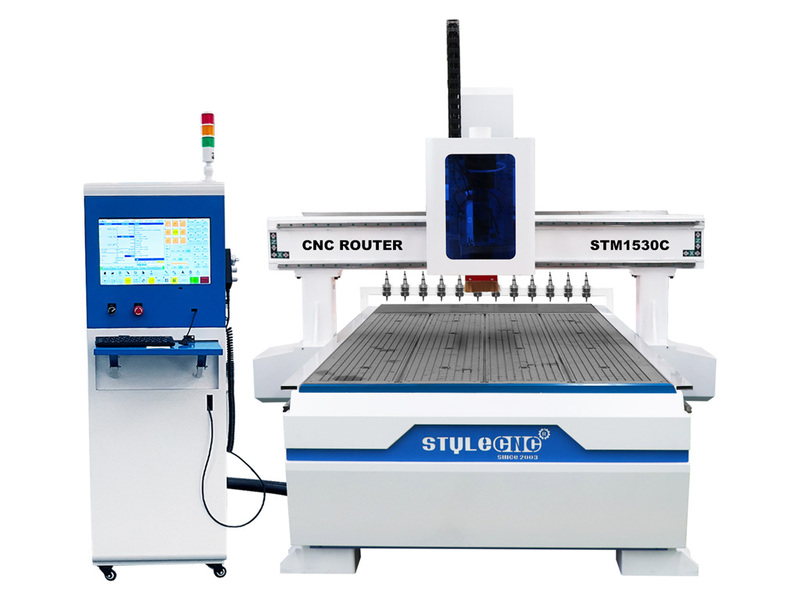 • Next: Why CNC working center is edging out the primary CNC router?